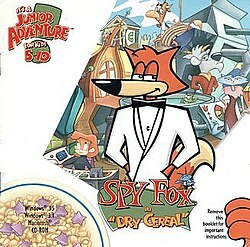 Spy Fox in "Dry Cereal" is the first of three games in the Spy Fox series developed by Humongous Entertainment and marketed by Atari. The game was ported to the Wii in 2008, utilizing the Wii Remote for point-and-click controls, but it only became available for a limited time due to legal problems concerning the port's development. In 2012, Nimbus Games Inc. released a version designed for both iOS and Android. The game has 2 million copies sold and received 20 Awards of Excellence. The game takes place on the fictional island of Acidophilus in Greece. William the Kid, the CEO of the Nectar of the Goats (N.O.G.) Corporation, plots to rid the world of cow's milk so that he can take control of the dairy world with his "delicious" goat by-products. By kidnapping all of the dairy cows in the world, including his rival, Mr. Howard Hugh Heifer Udderly III, the president and CEO of Amalgamated Moo Juice Incorporated, Kid plans to gather all of the dairy milk in the world in a giant milk carton called the Milky Weapon of Destruction, flood the capital with all that milk, frame the dairy cows for that crime, get them all thrown in cow jail, and eventually take over the dairy world. SpyFox is assigned to find Kid's secret fortress, where this Milky Weapon of Destruction is being held, and disarm the weapon and terminate Kid's scheme. The Spy Fox adventures retain the easy-to-use format of the other Humongous computer games, but unlike the others, the Spy Fox series introduces talk balloons. Talk balloons enable Spy Fox to ask any character a specific question instead of simply having an ordinary conversation. Monkey Penny offers Spy Fox a number of gadgets to make use of. Like other Humongous titles, Spy Fox offers minigames within the game. The Spy Fox games have multiple narratives; the story branches into a small number of threads midway through the game, and which thread the story follows is randomly selected each playthrough. Spy Fox in "Dry Cereal" received mixed to positive reviews from various critics. GameRankings gave 80% for the PC version and 55% for the Wii version, both based on 1 review, IGN gave a great 8.4 out of 10 score for the PC version, Adventure Gamers gave a 4-star rating, Allgame gave a 4.5-star rating and Unikgamer gave a 7.9 out 10 score. ^ "Mistic Software Inc". Mistic Software Inc. 2013. Retrieved April 1, 2015. ^ Cobbett, Richard (December 22, 2017). "How ScummVM is keeping adventure games alive, one old game at a time". PC Gamer. Retrieved December 28, 2017. ^ "Spy Fox in "Dry Cereal" Majesco Entertainment". Majesco Entertainment. Retrieved June 1, 2015. ^ a b "Spy Fox in "Dry Cereal" for PC - GameRankings". GameRankings. Retrieved May 27, 2015. ^ a b "Spy Fox in "Dry Cereal" for Wii - GameRankings". GameRankings. Retrieved May 27, 2015. ^ a b "Spy Fox in "Dry Cereal" Review". IGN. Retrieved May 27, 2015. ^ a b "Spy Fox in "Dry Cereal" Information, Screenshots & Media". Adventure Gamers. Retrieved May 27, 2015. ^ a b "Spy Fox series on Unikgamer". Unikgamer. Retrieved June 1, 2015. Life Is Rough When You Lose Your Stuff! This page was last edited on 5 March 2019, at 18:55 (UTC).